Indoor skydiving arrived in North Texas over the weekend. 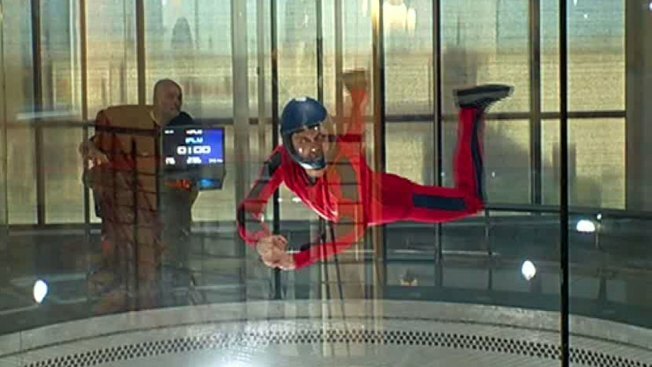 The daring can simulate skydiving at iFly, at 8380 state Highway 121 in Frisco, inside of a 14-foot- tall wind tunnel where winds of 200 mph keep people aloft. "It absolutely simulates free-fall conditions," said Shelly Jackson, director of sales and marketing for the center. "It's cool wind blowing in your face. Just a breath of fresh air. Easy and safe for everyone." Instructors teach newbies, from ages 3 and up, how to "fly" inside the tunnel and simulate a realistic skydiving experience. For about $60, flyers can take two trips lasting about 60 seconds each. Reservations can be made by phone or online at iflydallas.com. iFly also has locations in Austin, San Francisco, Seattle, Orlando and in Hollywood.